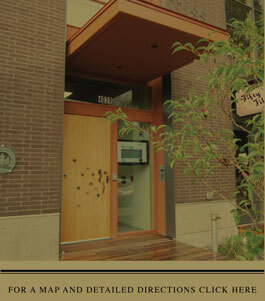 My building is located at 4039 N. Mississippi Avenue. BY CAR: FROM I-5 SOUTH. Take the Killingsworth St. exit (Exit 303) and then the Alberta Street ramp. Turn right on Alberta. Turn right on Albina. Albina becomes Mississippi. FROM 5 NORTH. Take Alberta St. exit (Exit 303). Turn right on Alberta. Turn right on Albina. Albina becomes Mississippi. on Mississippi and go two blocks east on Skidmore going over I-5. Turn right on Mississippi and go two blocks. BY BIKE: (from downtown) From Interstate, east on Failing, cross the bridge, left on Mississippi Ave. (from interstate) east on Skidmore, right on Mississippi Ave.
Vancouver (going south), west on Skidmore, left on Mississippi Ave. There are bike racks in front and inside the building on the ground floor.